This week has definitely felt autumnal- dark on the way to work, dark on the way back, and gorgeously coloured leaves on the trees. It’s definitely my favourite time of year, when you can hunker down warm and happy at home, and fill our tums with warming foods. We started the week with some enormous burgers I bought from Whole Foods. 1 was not enough but 2 would have been too much!!! Colin had some chips (from the freezer I’m afraid…) and a zingy tomato and red onion salad with a lemon dressing for me. 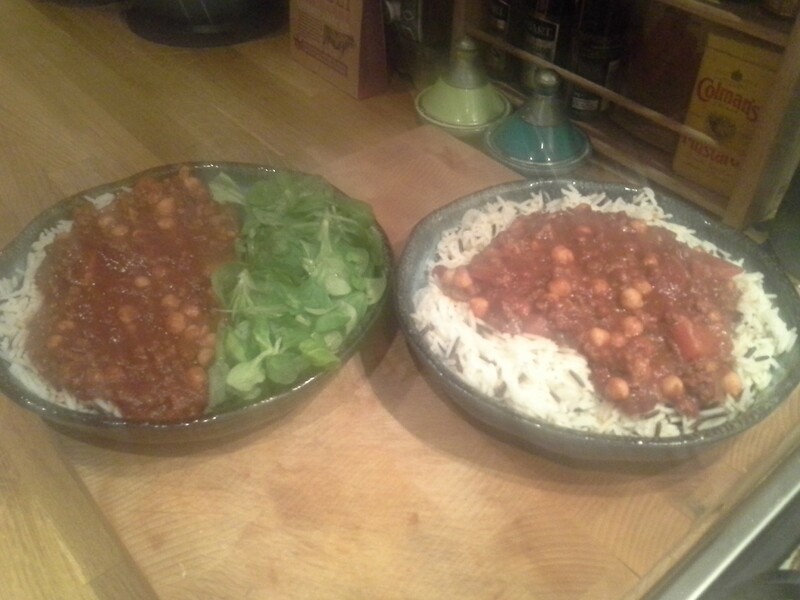 On Wednesday we had a Chilli Marrakesh, which we have had before but not for some time. In fact it took me a while to track the recipe down as I couldn’t remember where I had found it in the first place. I am so pleased I did manage to track it down as it is really delicious- all the things you love about a chilli, but with a Moroccan twist, lovely. Here’s a pic and a recipe for it too. Add the oil to a large sauté pan and fry the onions with the cumin seeds for 5 mins. Add the mince, ginger and garlic and cook until the mince is no longer pink. Stir in the tomatoes, spices and harissa and stir. Add the peppers, chickpeas and stock and cook for 45mins until thick but still juicy. And that’s it- quick and easy, filling and tasty, and a good alternative to a normal chilli. One of the meals that make us happy is stuffed peppers as it brings back some lovely memories of when I first moved to London and Colin would travel down from Manchester on a Friday evening. 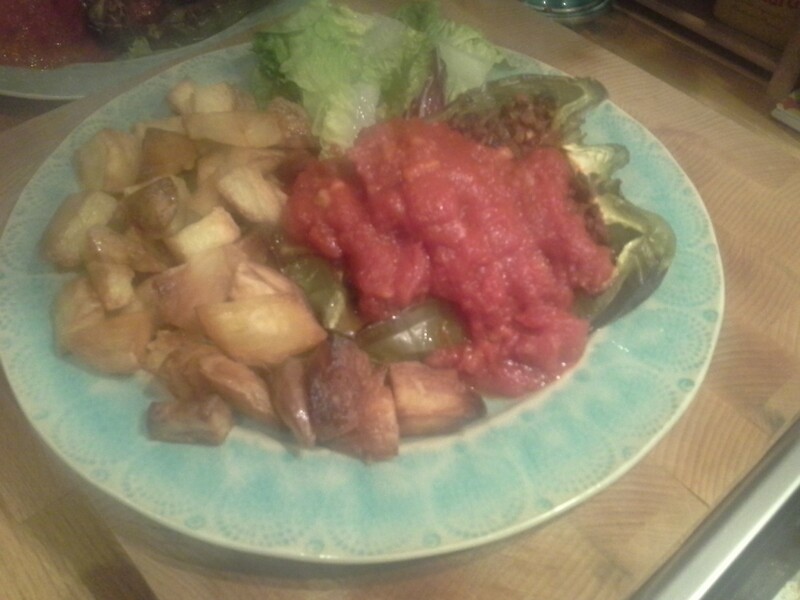 Tonight I stuffed an enormous green pepper with a spicy beef mince mixture, and served it with a cooked down tomato sauce and some fried potatoes (to keep Colin happy!). We finished the week with a fish curry made with salmon- a triumph as I got back from work late and wasn’t in a cooking mood, but somehow it turned out to be one of the nicest fish curries I’ve ever made! We are both really looking forward to the weekend as it is the first tome off together we have had since our holiday, which seems like months ago! Yippee!! !